The hypothesis that the years 2014-2015 are of high prophetic significance based on the conjunction of lunar eclipses, Hebrew holidays and an alleged ‘Shemitah” year has gained rapid attention in evangelical Christian circles. This approach has become more than the thought of one or two men; it has become a movement. It appears that this movement started with the work of Pastor Mark Biltz, was picked up by a messianic Rabbi named Jonathan Cahn and by television evangelist, John Hagee. Books, DVDs, Study Guides, blogs and media appearances have multiplied as the interest in this topic has intensified. This white paper is not designed to examine one particular author and/or one particular book. It is an attempt to factually test common claims associated with this movement. Not every claim dealt with in this paper is held by every promulgator of the general point of view. The reason for this is that this paper is designed for the ordinary investor who is troubled by these claims at the grassroots level and at the grassroots level, these various ideas are widely drawn from various broadcasters, authors and speakers. Those interested in learning more about the individual views should consult Blood Moons by Mark Biltz; Four Blood Moons by John Haggee or the work of Rabbi Cahn who has been probably the most prolific of these authors, and the one most focused on financial consequences of the events. Rabbi Jonathan Cahn’s bestselling books, “The Harbinger” and “The Mystery of the Shemitah” along with Rabbi Cahn’s numerous sermons and media appearances propose the theory that a market collapse is likely to occur in the fall of 2015 in close proximity with the lunar eclipse of September 28th, and perhaps in the Spring in close proximity with the lunar eclipse of April 4th, and that other events of great prophetic significance are also likely to occur this year. The theory holds that the law of Shemitah, that is the Torah stipulation which mandates a debt ‘release’ every seven years, applies not just to Israel, but to other nations such as the United States, as well. Rabbi Cahn maintains that the Shemitah year system is turned from a blessing into a curse, particularly a financial curse when it is not observed. In addition, it is claimed that 2014-2015 is a Shemitah year and that this, along with the appearance of four lunar eclipses over a two year period (a tetrad) which fall on Hebrew holidays, constitutes a great convergence. For this reason the Rabbi suggests that investors be out of the stock market during the times of these blood moons, especially the one which falls on the beginning of Sukkot. According to this point of view the Shemitah years are found below, from www.shemitah-blood-moons.net. The Shemitah/Blood Moon hypothesis does not seem to represent the mainstream view of any major theological school or tradition. However, theological difficulties are beyond the scope of this report. This paper is more concerned with ‘fact-checking’ various claims from history, financial data and astronomy/celestial mechanics on which the theory rests. There are some major issues with historical claims made by the Shemitah theory advocates. The website www.shemitah-blood-moons.net, one of the most popular shemitah-theory sites, makes various claims about historical events which are alleged to have occurred during the Shemitah years of the first half of the 20th century. While the U.S. did enter the First World War in 1917, they did not immediately end it. World War I ended 18th of November, 1918 – a full year after the end of the 1916-1917 Shemitah year. Stating that the war ended in 1917 is simply false, and the impact the U.S. entrance into the war had on its ultimate outcome is a matter of great debate among historians. Again, incorrect. The Central Powers all collapsed in the Autumn of 1918. In fact, the German and Austro-Hungarian Empires were improving their standing in the war in 1917. The Germans and Austrians were able to focus the vast majority of their military 4 Bowyer Research Shemitah Years and Blood Moons as Market Timing Tools Historical Issues power on the Western front, as the Russian revolution ended the Eastern Front. The Central Powers were favored to win the war until General Ludendorff’s failed offensive in the spring of 1918. In fact, the Allies suffered nearly 2 million more causalities by the end of the war than the Central Powers. 1918 is a much more significant year in the course of the war and the course of Christian civilization than the Shemitah year of 1916-1917. Kristallnacht is, indeed, widely considered the starting date of the Holocaust, and is thus an incredibly significant event in the history of the Jewish people. There’s just one problem: it did not take place in a Shemitah year. The Shemitah year of 1937-1938 ended September 25th. Kristallnacht took place the night of November 9th, 1938; well after the end of that Shemitah year. More widely speaking, September of 1939, the start of the Second World War, is by any measure a more historically significant year than 1937-1938 Shemitah year. While historically accurate, (1945 is without doubt one of, if not the, most significant year of the 20th Century) it cannot be used to support a prediction of catastrophe in 2015. 1945 contained the end of one of the most murderous states in human history, and the end of the world’s bloodiest conflict. It was most certainly a good year, not a bad one. 1945’s Shemitah year status might be considered evidence for a simply significant event taking place in a future Shemitah year, but it is not evidence for a catastrophic event. Another historical inaccuracy: the treaty that established the U.S. dollar as the world’s reserve currency was signed in July of 1944, two months before the start of the 1944-1945 Shemitah year. This is a more minor concern, but the super-power status of the United States at this time is highly debatable. Generally, International Relations scholars define a super-power as a state with significant global power projection capabilities, and the ability to fight two or more regional conflicts at the same time. The U.S. did not have significant power projection capabilities in Eastern Europe, the Middle-East or Sub-Saharan Africa until well into the Cold War; in 1945, it needed to rely on partners, particularly the British Empire, to project power in these regions. Lunar eclipses during the Biblical feasts are conventional occurrences for the simple reason that the Hebrew calendar is a lunar calendar. Certain Holy Days occur on new or full moons precisely because they are timed to them. It is no more surprising to find a full moon on the feast of Booths, than it is to find the sun at its apogee in the sky at the same time that people are eating sandwiches. Noon is the time when the sun is highest (or close 6 Bowyer Research Shemitah Years and Blood Moons as Market Timing Tools to it), and we schedule lunch at noon. There is nothing supernatural about this, except the ‘miracle’ of the regularity of the skies. The Biblical calendar is keyed mainly to the moon; in fact, ‘new moons and festivals’ is a Pauline short-hand for the keeping of Jewish festivals. That having been said, the current “tetrad” of four consecutive total lunar eclipses during the feasts of Passover and Tabernacles in 2014 and 2015 is admittedly rare. But apart from their astronomical significance, do they possess ‘prophetic’ significance, or significance in terms of the rise and fall of nations as advocates have claimed? The “Blood Moon” devotees have asserted that previous similar tetrads have transpired with prophetically significant events in Jewish history: accompanying the establishment of the state of Israel in 1948 (a popular event with eschatologists); with the Six-Day War between Israel and Egypt in 1967; and previously, with the expulsion of the Jews from Spain in 1492. However, a comparison of the relevant dates shows that the historical events actually occurred BEFORE most or all of the eclipses of the associated tetrad. The relevant historical event is bolded, and the astronomical events are italicized. It does not seem that “signs in the heavens” would have much prophetic value if they occur AFTER the event with which they are associated. If it were the case, if we were to continue the pattern established by these previous tetrads, the current eclipses of ’14 and ’15 should have been preceded by some Biblically significant event in Jewish history. It also seems doubtful that such events can reasonably be inferred to act as ‘signs’ to the people of Israel if they are not visible from Israel. How can a sign which appears only in the Western hemisphere, or even over the Atlantic Ocean possibly be a sign for the people of Israel? Several of these blood moons, that is lunar eclipses, were invisible from Israel. More on this below. None of these events appear to coincide with any major event in Jewish history. In fact, the first of these tetrads, 162-163 AD, takes place 30 years after one of the most important dates in Jewish history: the Bar Kokhba rebellion. The Bar Kokhba rebellion of 132-136 AD was a massive revolt by the native Jewish population in the Roman province of Judea that resulted in the deaths of hundreds of thousands of Jews, the barring of Jews from entering Jerusalem, and the outlawing of Torah law in Judea. The year 795-796 did not see events of any very strong importance to the Jewish people. The only major international event that took place in 795-796 AD was the creation of a series of buffer states in northern Spain by the Carolingian Empire. This had little importance in the larger Christian-Muslim war in Spain, and no direct relavence to the Jewish people. The tetrad of 842-843 coincided with no major event in the history of the Jewish people or Jewish homeland. The only major event in this period was a treaty that broke up the Carolingian Empire, but this was after a brief civil war regarding dynastic affairs, not religion. The final of these dates, 860-861, also did not coincide with any event of major importance to the Jewish people. The most important date of 860-861 was the defeat by the Byzantine Empire of the last Arab invasion of the Turkish region – again, this has no direct importance to the Jewish people. The significance of this event in Christian history is also high debatable. considering the Turkish state replaced the Arab states as the major threat to Christian civilization just two centuries later. One might think that eclipses portending events in the history of Israel should be visible from Israel. However, this is not the case with the current “Blood Moons.” As seen from Israel, the eclipsed moon would be invisibly hidden below the horizon for three of the four eclipses of the 2014-2015 tetrad. Only the eclipse of September 28, 2015 will be visible from Israel, and even then, the Moon will not enter the stage of total eclipse until less than an hour before sunrise, local time. It seems unlikely that a set of eclipses that are mostly invisible from Israel can have any value as portents concerning the nation of Israel. Moreover, some of the eclipses of the previous tetrads were also invisible from Israel. The total lunar eclipses of 1493, 1494, 1949 and 1950 were at least partially visible from Israel. However, both of the total eclipses of 1967 and one of the eclipses from 1968 were completely invisible from Israel. The other eclipse of 1968 would have only been seen in a stage of partial eclipse, just before sunrise. At the very least, there is no consistency to such a pattern of “signs and wonders” as concerning the state of Israel. Thus, there should be little reason to expect that the Israelis themselves would have construed such eclipses as portents having any prophetic correlation to the associated events. There is no clear pattern with the blood moon tetrads suggesting any relevance to the nation of Israel. Based on the astronomical circumstances, there is no apparent significance of a tetrad of lunar eclipses that coincide with the Biblical feasts. Certainly there is no reason to regard these alignments as momentous and apocalyptic. Rather, these eclipses simply represent a fortuitous convergence of celestial cycles, with the Earth and Moon following the paths ordained by their Creator, determined beforehand through modern celestial mechanics, and confirmed with our eyes by direct observation of the sky. Rabbi Cahn points out that out of the ten largest stock market declines in the past 100 years, 8 of them occurred on Shemitah years, and this suggests a major market correction is about to occur. He does not provide underlying data for this claim, but our analysis shows that this claim can only be based on point declines in stock markets, not percentage declines. If one looks at single day point declines one can verify the 8 out of 10 number. However, there are problems with this use of data: historically large point declines can actually represent very small fluctuations in market value. That’s because over the long term nominal values of stock markets have grown vastly higher in response to gradual monetary debasement and rising price indices. Today with DJIA markets hovering near 18,000 it is common to have 300-400 point changes in any given day, swings that are as large as the entire value of the Dow in 1929 before the crash! In fact, the great crash of 1929 did not occur on a Shemitah year and does not fall in the list of ten largest point corrections in the last hundred years. So, Rabbi Cahn is correct when he says that eight of the top ten largest collapses have occurred in Shemitah years, but he did not point out that 5 of that 8 were all in 2008, and that the remaining 3 were in 2001. When one looks at percentage changes in market value, the standard measure of market corrections/collapses, we find only 3 of the top ten occurred in alleged Shemitah years. 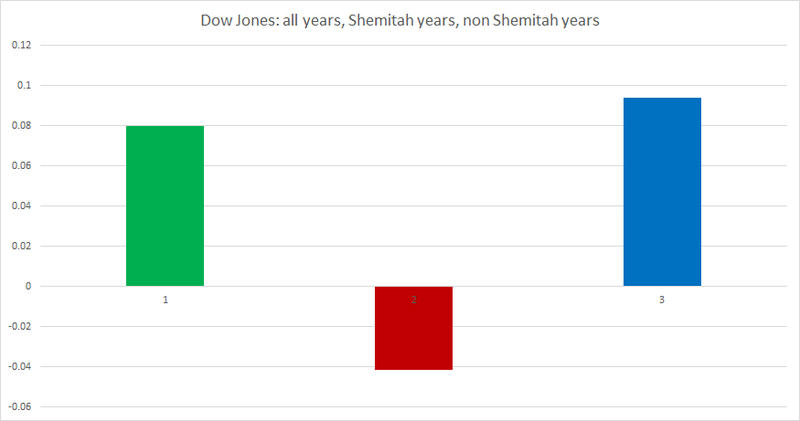 This chart shows the average percentage change in the price of the Dow Jones Industrial Average for all years in green, Shemitah years in red, and non-Shemitah years in blue. This chart is based on data organized in accordance with the Jewish calendar year, which generally starts in mid-to-late September. This chart takes the average from 1903 to 2015. On average, the Dow Jones price declined by 0.041% in Shemitah years, and rose by 0.9% in non Shemitah years. However, if you exclude 2008, the average decline in Shemitah years is only 0.029%. In terms of the top 20 largest daily percentage declines in the Dow Jones in history, 9 out of 20 took place on Shemitah years. If you exclude 2008 (which is an outlier year which contains several top 20 market declines), only 5 out of 20 take place in Shemitah years. As for the 20 largest gains, 7 are Shemitah years, and 2 of those 7 were from 2008. In the last century, when you exclude 2008, the probability for there being a major market correction in a Shemitah year in the 20th century and early 21st century is slightly above 1/7. Statistically, it’s hard to find justification for the claims that alleged Shemitah years constitute high probabilities for major market corrections. The “Blood Moon” eschatology we have been discussing places great significance on the (accurate) fact that our current “tetrad” of four total lunar eclipses during 2014 and 2015 coincides with the Hebrew feasts of Passover and Tabernacles (Sukkoth). This is used to suggest that the current tetrad is a portent of another great event, perhaps even presaging the return of Christ. Some are troubled by these tidings, concerned that dire circumstances lie ahead, wondering what the future may hold, unsure how to handle investments in light of such uncertainty. However, we should all rest easy in this particular instance. The simple fact is, there is nothing remarkable about lunar eclipses occurring during the Biblical feasts. In fact, it is a commonplace natural occurrence. It is important to distinguish supernatural “signs and wonders” from the normal movements of the celestial objects. The cycles of the Sun, Moon and planets are among the most regular and predictable of all natural phenomena. The discovery of the natural laws that govern the celestial order above is the triumph of the modern physics of Isaac Newton. It is because of this regularity that the LORD appointed the Sun and Moon to be timekeepers (Gen. 1:14), that we might create calendars, and know in advance the times for planting and harvesting (Gen. 8:22). This predictability is essential to our daily lives, for the annual cycle of food production and for many other things we take for granted, such as the agricultural commodity futures market. The precision of the modern calendar also enables eclipses of the Sun and Moon to be accurately calculated for millennia backward and forward through time. Important dates in history have been determined by the timing of past eclipses. For example, the traditional dating of the birth of Jesus is based on a chronology which depends on a mention by the Jewish historian Josephus of a lunar eclipse that occurred towards the end of the reign of King Herod the Great. Similarly, future eclipses are foretold with minute precision. Eclipse prediction is so accurate and reliable that it represents a type of “scientific Calvinism” in which every eclipse that will ever happen into the distant future is already predetermined, and written down in advance in tables of data. These eclipses always come to pass as predicted; simply put, there are no surprises ahead where eclipses are concerned. This regularity of the Sun and Moon is the basis for the Biblical feasts. Scripture states that Passover is timed to land on “the fourteenth day of the first month,” which is understood to be the first Full Moon of spring (Lev. 23:5). Similarly, the Feast of Tabernacles is given as “the fifteenth day of the seventh month,” which occurs at the Full Moon of fall, on the opposite side of the year, six lunar months apart from Passover (Lev. 23:34). The days of the months for these feasts are found by counting the number of days from the first appearance of the Moon in the evening sky, which is the “Rosh Chodesh” or “beginnings of the months” in the Hebrew lunar calendar (Num. 10:10). Our generation is unaccustomed to observing the simple monthly cycle of the Moon’s phases, even though it is before our eyes every day of our lives. But the Moon’s phases are very easy to understand for anyone who will consistently make observations at sundown and sunrise over the span of a month, even little kids. An eclipse of the Moon occurs when the Moon enters the Earth’s shadow, which can only occur during a Full Moon. Some eclipses just graze the Earth’s shadow, being a partial eclipse, but some are total, when the Moon is fully immersed in the darkness of the Earth. This is different from a solar eclipse, in which the Moon blocks the Sun and casts its shadow on the Earth, which can only happen during a New Moon, on the opposite side of the month. The rules for finding lunar eclipses are very similar to those of the Biblical feasts: at least two lunar eclipses always occur every year during the times of the Full Moon, and two lunar eclipses are always paired to fall at opposite Full Moons, six months apart, also on opposite sides of the year. The Moon’s orbit is slightly tilted to the Earth’s orbit around the Sun, and lunar eclipses can only occur when the Moon crosses the plane of the Earth’s orbit during the Full Moon. Otherwise, we would have an eclipse every month during the Full Moon. Due to a complex gravitational interaction with the Sun and the Earth, the Moon’s orbit slips backwards, so that eclipses can occur in any month of the year, following an 18 year eclipse cycle. The bottom line is, the Moon’s orbit lines up so that pairs of lunar eclipses coincide with Passover and Tabernacles about onesixth of the time, or every six years. However, any particular lunar eclipse is not visible from every location on Earth, just as not every lunar eclipse is total. For the most part, people don’t usually pay attention to such things, and most do not understand the Full Moon connection to both eclipses and Biblical feasts. So these events usually go unnoticed and unreported. It’s only been due to the recent “Blood Moon” hype that attention has been drawn to this commonplace association of eclipses with the feasts. But there is surely nothing supernatural about the convergence of these natural, predictable lunar calendar cycles. During a total eclipse, the Moon can take on a reddish-orange color, causing a “bloody” appearance, evoking Joel 2:31 and Acts 2:20, and the “breaking of the sixth seal” in Rev. 6:12. But each of these prophecies also mentions a concurrent darkening of the Sun, as in a total solar eclipse. But this cannot happen at the same time as an ordinary lunar eclipse, since the Moon can’t be in two places at once! The causes of solar and lunar eclipses were well understood in New Testament times, and were commonly known even then to be natural phenomena and not supernatural signs. So the ancient hearers of these Scriptures were undoubtedly looking for a supernatural event to fulfill these prophecies, rather than the commonplace, twice-annual lunar eclipses. The only reason that this convergence of eclipses with Hebrew feasts seems significant is just that few people have actually paid attention to these cycles prior to the current “Blood Moon” hype. Investors and everyone else can place their trust in the LORD, and remain confident that 2015 will come and go like any other year, at least with respect to lunar eclipses and Biblical feasts. But as with all things theological, believers should search the Scriptures like the Bereans (Acts 17:11) and discuss the matter with their pastors. And with financial matters, consult with a financial advisor who shares your values before engaging in major portfolio changes based on popular eschatological speculations. Take time to look at the sky and learn to observe the amazing clockwork that the Creator has placed over our heads.